Sanitation issues deeply impact lives in Africa. 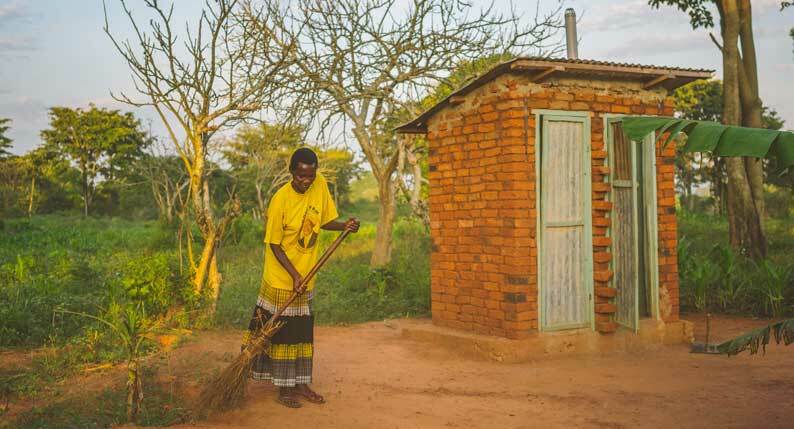 In places like rural Uganda where Medi lives, only 17% of the population have access to improved sanitation. But people like Medi are working hard to solve sanitation issues and transform their communities. Medi is a teacher at the local school in Kigooto, a village in eastern Uganda. He has a big personality and loves learning. We met him at a village celebration— men, women and children had gathered to celebrate Kigooto’s designation as an Open Defecation Free (ODF) community. For westerners, this may seem like an odd thing to celebrate, but ODF is a huge step in bringing health to a community and one of the cornerstones of becoming a healthy village. People were singing, playing music, and dancing with joy. Medi introduced speakers who shared the changes that have taken place in Kigooto since Lifewater began working with them. Children were healthy and in school, and the people living in Kigooto are so proud of their hard work and healthy village. Medi boldly declared, “Come to my house and see that what we are saying is the truth!” So we followed him down the path through the village to his home. Along the way we saw signs of Healthy Homes everywhere: tippy-taps for washing hands, drying racks to keep dishes away from animals, latrines, and cleanly-swept compounds. At Medi’s home, we met his wife Aisha and son Salim, his mother and father, and some of his brothers and their families, too. He proudly showed us his Healthy Home features and certificate. Medi’s household, though large, worked as a unit. The daily work burden is spread out among the entire family and everyone seems to pitch in, including Grandpa who gets up early to sweep the compound clean. All the elements of a certified Healthy Home are in place and maintained at Medi’s home; there was the latrine with pit covers, the tippy-tap for hand washing, the drying racks, and a safe way to store their clean water. Medi’s family and Kigooto have great reason to celebrate. They’ve worked hard and now they are experiencing the fruit of their labor.